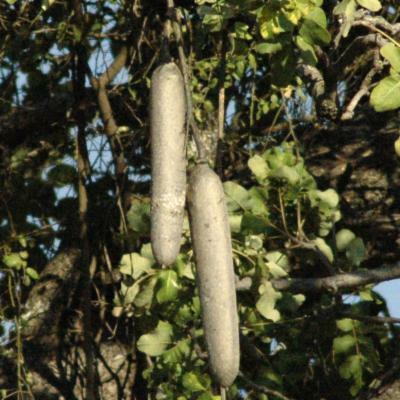 Kigelia africana is an African tree, easily recognised due to the large sausage-shaped fruits hanging from its branches. 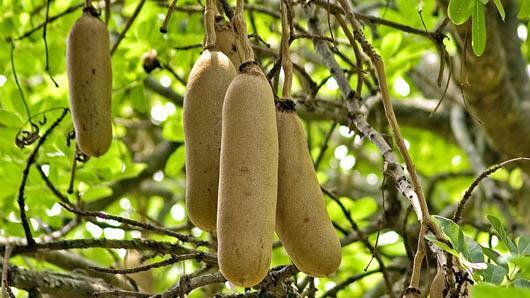 The generic name Kigelia comes from the Mozambican name for sausage tree, 'kigeli-keia'. Sausage trees are sacred to many communities and are often protected when other forest trees are cut down. In Kenya, the Luo and Luhya people bury a fruit to symbolise the body of a lost person believed to be dead. Shrub 2–3 m tall or tree often with wide spreading crown, 2.5–18(–24) m tall and possibly larger (but reports of up to 35 m incorrect). Bark usually grey, occasionally brown, smooth to rough or ridged, scaly or flaking. Leaflets thin to very coriaceous, (2–)3–8-jugate, oblong, elliptic, ovate or obovate, (6–)10–20(–30) × (4–)6–13(–16) cm, acute to cuneate or rounded, truncate, or emarginate at the base, entire to serrate (particularly sucker shoots), rounded, obtuse or acute to distinctly acuminate at the apex, glabrous to pubescent or tomentellous, smooth or often slightly to very scabrid with raised pale dots, peltate and punctate glands sometimes present; venation plane or sometimes raised or impressed, with 7–12 pairs of veins. 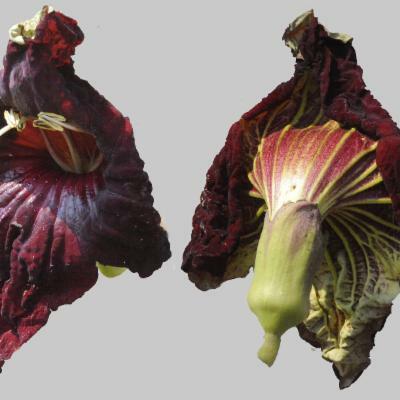 Flowers said to smell unpleasant, in lax terminal hanging panicles 30–80(–150) cm long including peduncle up to 40 cm long. Bracts lanceolate, 1 cm long. Pedicels hooked, 1–4(–5) cm long. Calyx campanulate, 2–5 cm long, ± 2–lipped, irregularly lobed, the lobes ± 1 cm long, tomentose to glabrous, with scattered glands. Corolla at first with tube yellow outside, turning orange or red and with dark red to blackish inside, 3–9 cm long, cylindrical at base for a very variable length; lobes yellow-green outside suffused with crimson, dark crimson inside, ± ovate, 3–4.5 cm long and wide. Fruits cylindrical, 30–90 cm long, 7.5–10 cm wide, tough and woody; stalks up to 50 cm long. Seeds ovoid, ± 11 mm long, 7 mm wide and 4 mm thick. 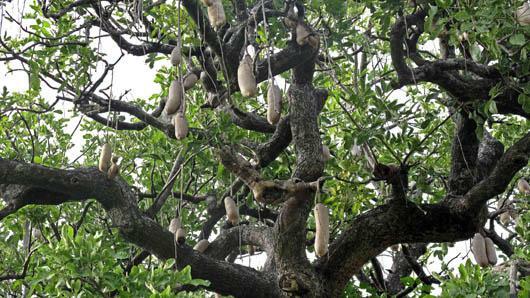 The sausage tree is sacred to many African communities and has a wide variety of uses in traditional and Western medicine, including commercially available skin lotions. 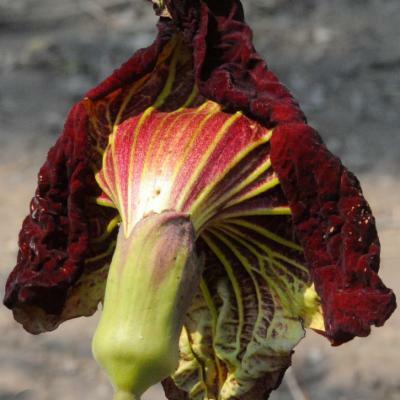 The flowers only open at night and are pollinated by bats and hawk-moths. 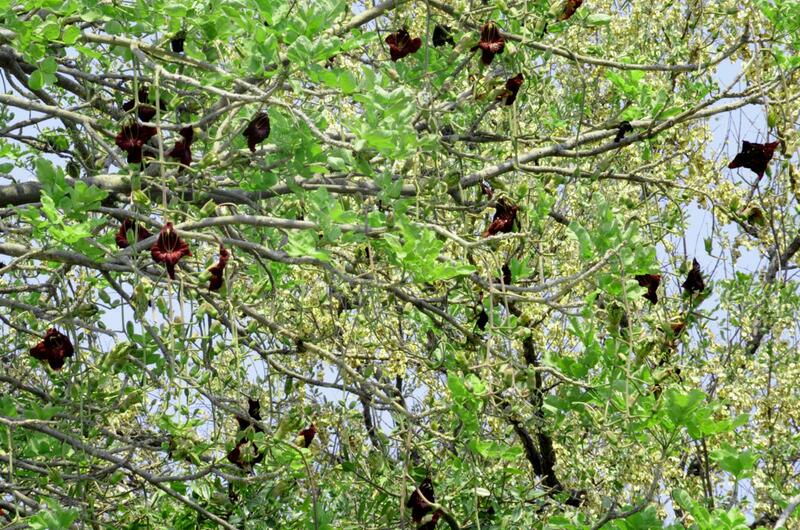 They are dark red, which is unusual for a bat-pollinated species (bats are normally attracted to white flowers), but the strong unpleasant smell of the flowers is thought to attract bats. 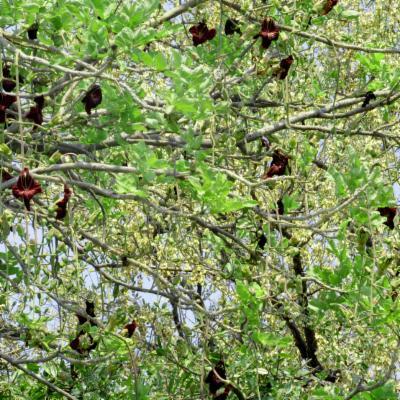 Every part of the tree is used in herbal medicines (eg for digestive and respiratory disorders, and to treat infections and wounds). 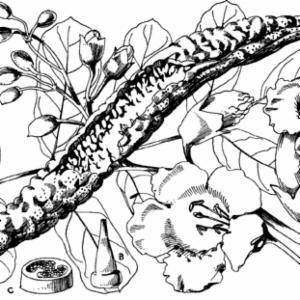 The sausage tree is used in a variety of commercial applications to treat skin complaints. Research into its anti-bacterial, anti-fungal and anti-tumour activity is ongoing. 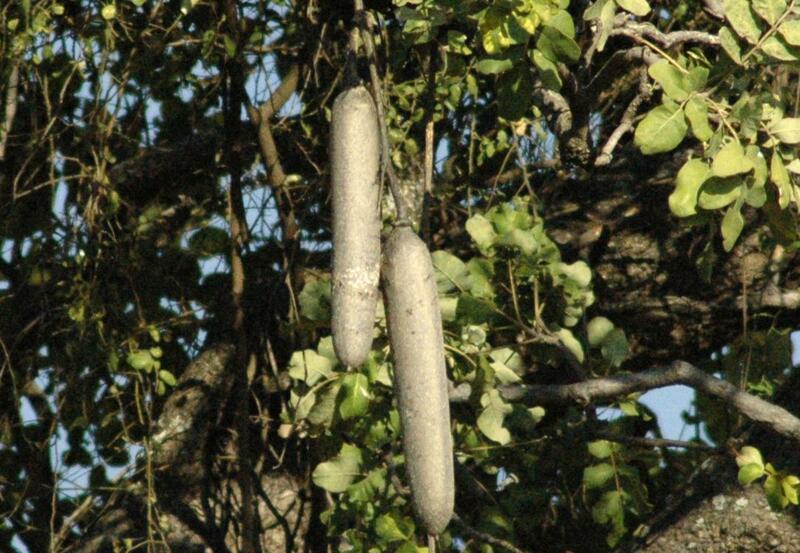 The sausage tree is found across sub-Saharan tropical Africa and as far south as South Africa. It is cultivated in other tropical countries and is used as an ornamental tree in Australia, the USA and parts of South-East Asia. 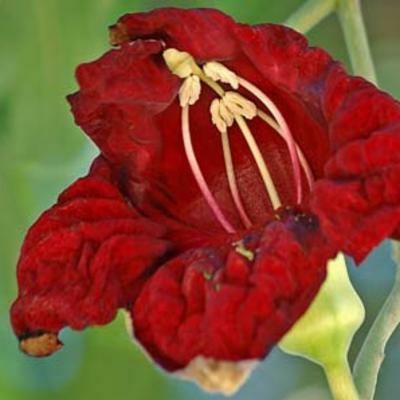 Kigelia africana is a tree, 2.5-18 m tall, or sometimes a shrub 2-3 m tall. The bark is smooth and grey-brown in colour. The leaves are in groups of three at the ends of the branches and are 10-20 cm long with 3-8 leaflets. The inflorescence is a panicle, 30-80 cm long. 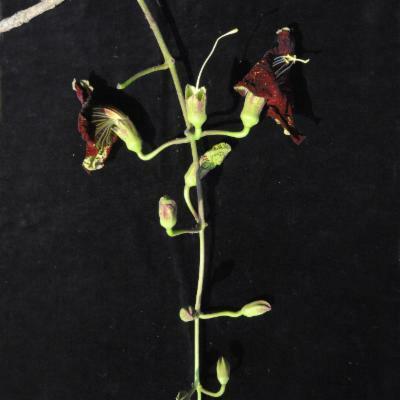 The tubular flowers are dark red with yellow veins, and have an unpleasant smell. 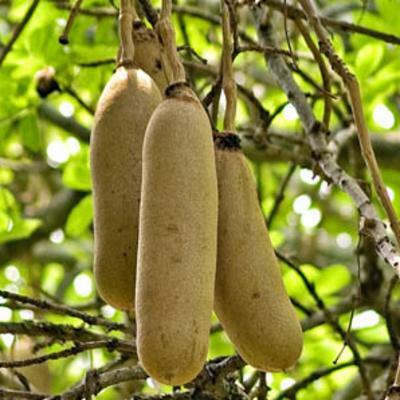 The fruits are sausage-shaped, 30-90 cm long and 7.5-10 cm in diameter. The sausage tree is very variable in habit and leaf morphology. 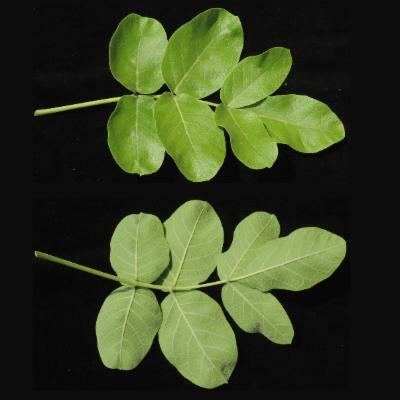 Trees growing in forests have larger leaflets than trees growing in open areas. 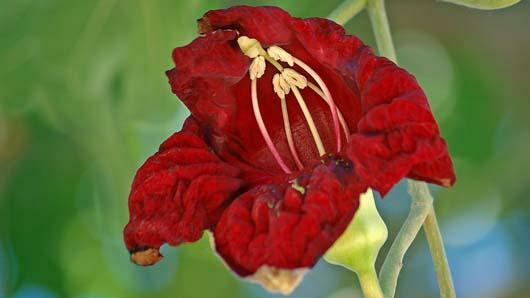 It was once thought that there were ten different species of Kigelia , but botanists now recognise only one. In East Africa two subspecies are recognised, K. africana subsp. 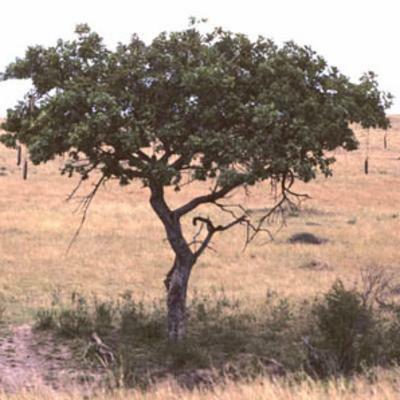 africana growing in grasslands and woodlands and K. africana subsp. moosa in tropical forests. 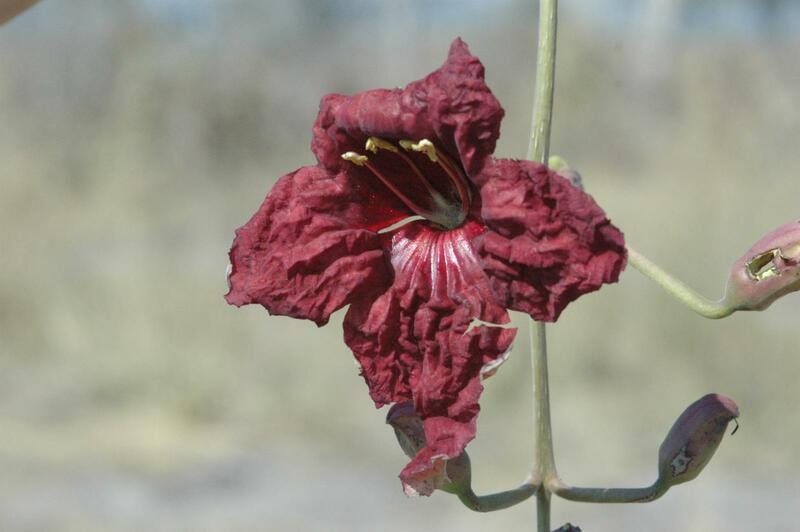 A comprehensive collation of data on sausage tree has been made by Kew's Survey of Economic Plants for Arid and Semi-Arid Lands (SEPASAL). 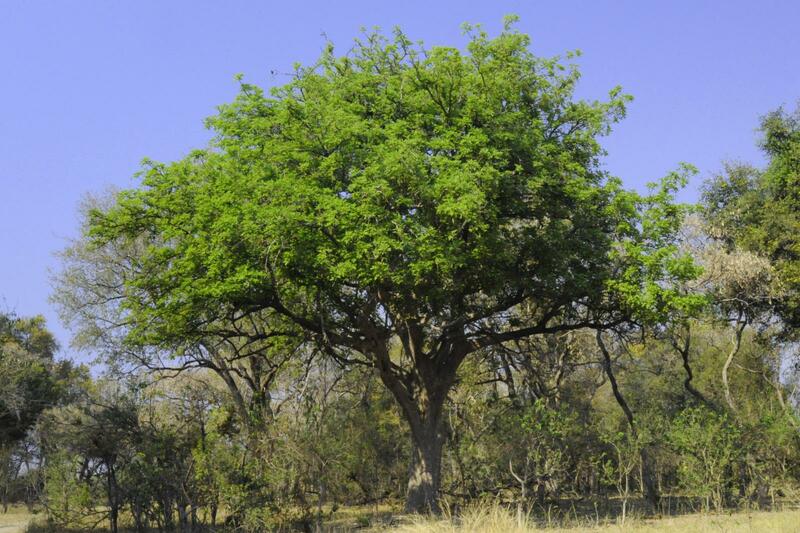 Apart from detailed information on uses throughout Africa, the SEPASAL database (available online) also records over 400 vernacular names by which the sausage tree is known - an indication of the tree's importance and value to communities throughout its geographic range. 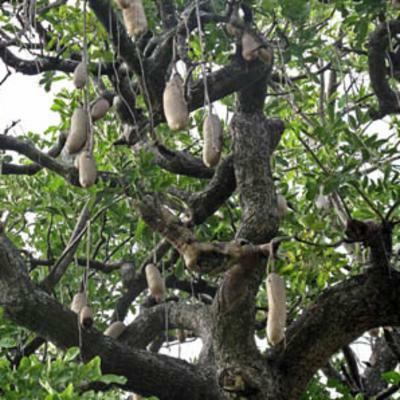 The sausage tree is widespread across tropical Africa. 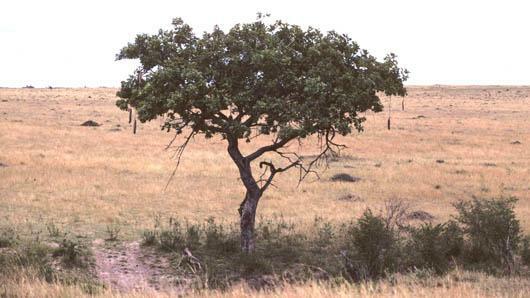 It is a sacred tree for many communities and is usually protected on farm lands when other tree species are cut down. 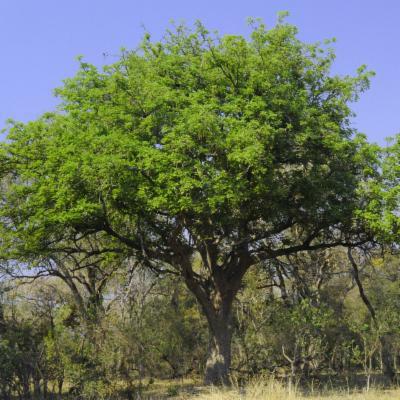 In Malawi, Kigelia africana is now protected after many trees were cut down to make canoes. 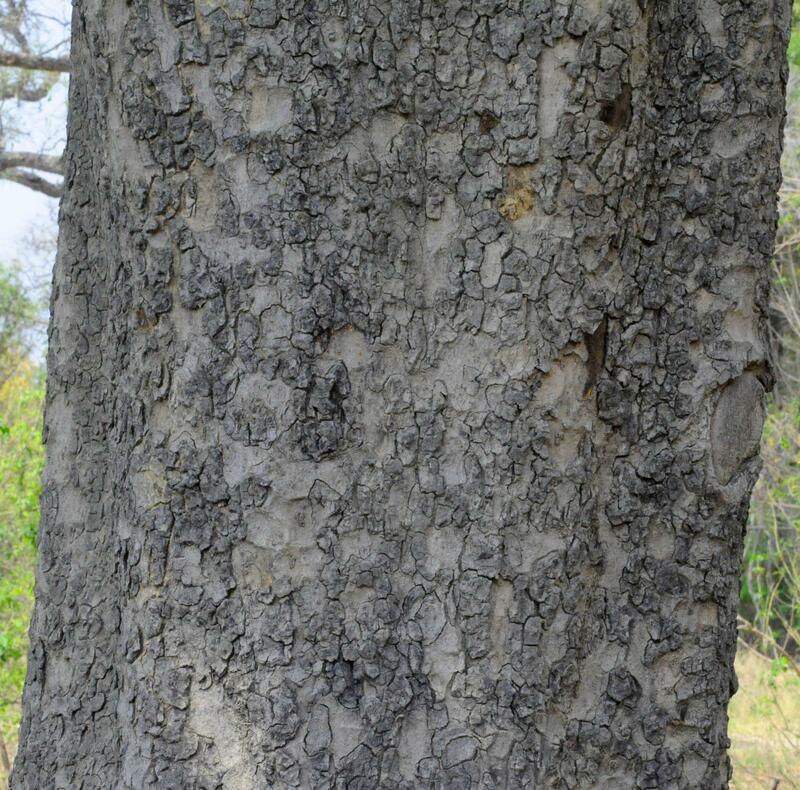 Kigelia africana is an important tree for many people and has a wide range of uses. Both ripe and unripe fruits are poisonous to humans but the fruits can be dried and fermented, and used along with the bark to enhance the flavour of traditional beers. 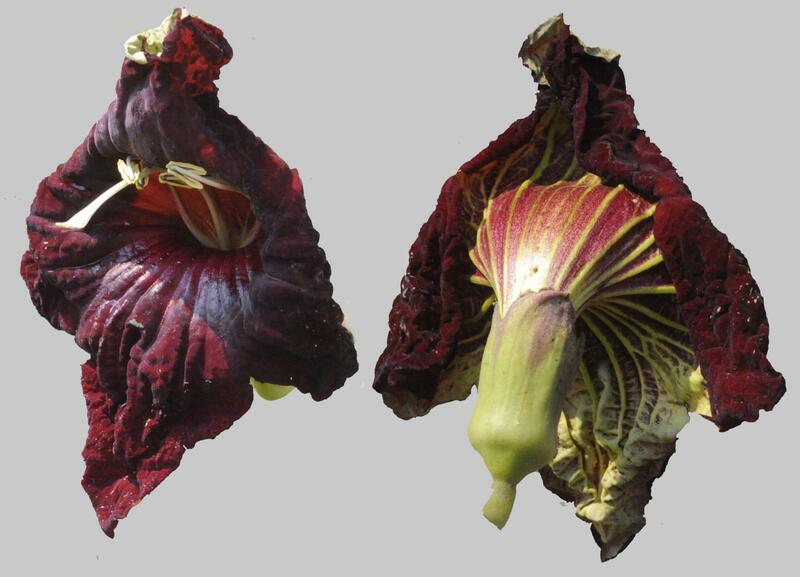 The seeds are sometimes roasted and eaten in times of food shortage. The wood makes good quality timber for fences, planking, boxes and canoes. 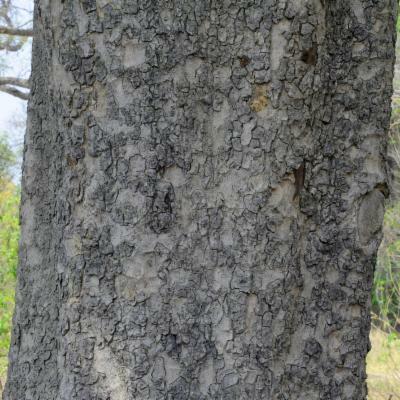 Kigelia africana is a suitable tree for planting to stabilise riverbanks, while its broad canopy makes it a good shade tree in the open savanna. It is, however, not advisable to park a vehicle or to sit beneath a fruiting tree - the 'sausages' (fruits) can weigh up to 12 kg and can cause considerable damage when they fall! 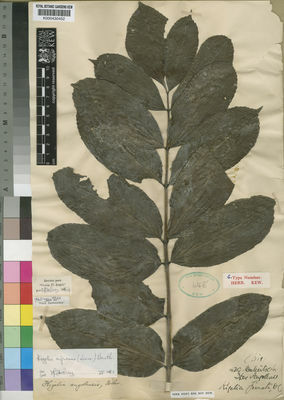 Two collections of sausage tree seeds are held in Kew's Millennium Seed Bank based at Wakehurst in West Sussex. The sausage tree can be seen growing in the Palm House and the Princess of Wales Conservatory. Dried and spirit-preserved specimens of Kigelia africana are held in the Herbarium, one of the behind-the-scenes areas of Kew. 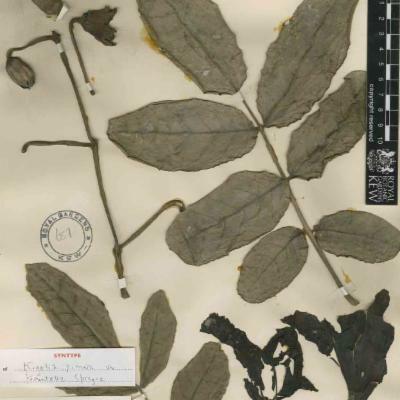 Details, including images, of some of these specimens can be seen on-line in the Herbarium Catalogue. 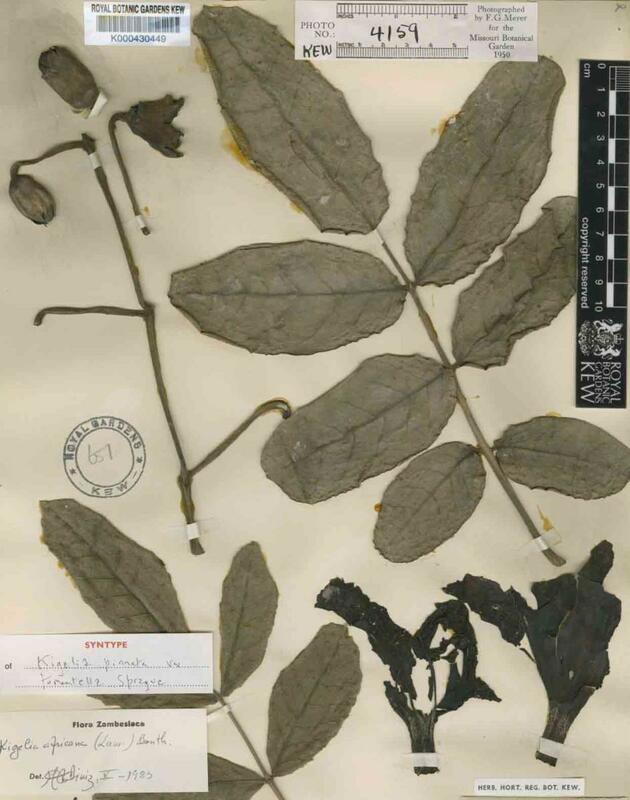 Bark, fruits, seeds and wood from K. africana are also held in the Economic Botany Collection. These specimens are made available to researchers from around the world by appointment. Riverine forest, wooded grassland, savanna and forest margins. 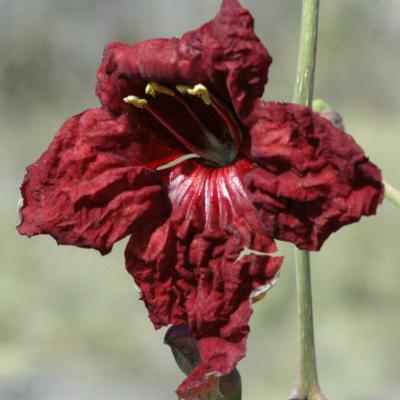 Least Concern (LC) in the Red List of South African Plants. Both ripe and unripe fruits are toxic to humans and can also do considerable damage if they fall on vehicles or unsuspecting humans. Medium or large sized tree up to 25 m. tall. 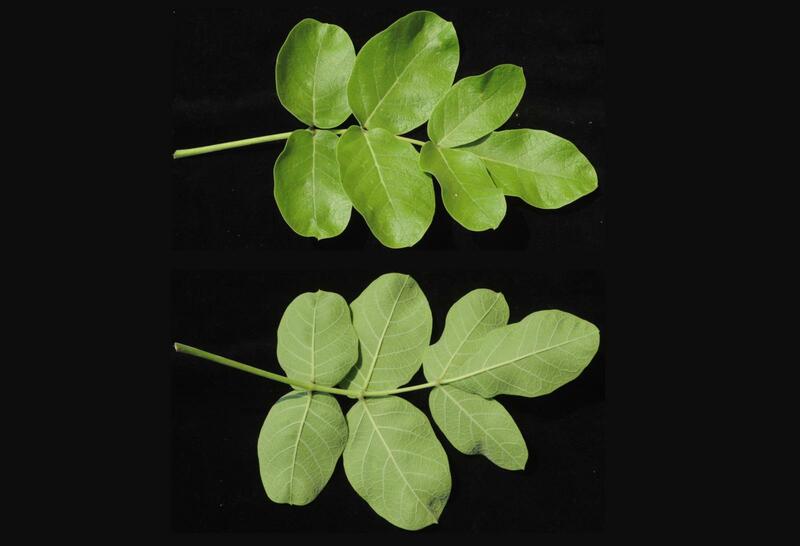 Leaves opposite or in whorls of 3, imparipinnate, crowded towards the tops of the branches; leaflets (1) 2–5-jugate, sessile or subsessile, except the terminal ones with petiolule (0.7)1–4(6.5) cm., long; leaflet lamina 3.5–17.5 (22.5) x 2.5–11 cm., ovate elliptic, obovate to rounded, apex obtuse, broadly tapering to rounded or retuse ana not so often apiculate, base rounded to cuneate, slightly to profoundly asymmetric except in the terminal leaflet which is asymmetric, glabrous to more or less hairy in both surfaces sometimes more roughly hairy in the superior one, papyraceous to coriaceous, margins entire, serrate or toothed and sometimes conspicously wavy; lateral nerves (4)6–13 pairs impressed above, prominent below, venation laxly reticulate; petiole (2)3.5–14(16) cm. long; rhachis 3–25 (29) cm. long, sulcate above, terete below. Flowers in pendulous very lax, terminal panicles, 30–100 (150) cm. long, longly pedunculate; pedicels 1–11 (13.5) cm. long, upcurved at the tip; bracts small lanceolate caducous. Calyx shortly tubular to campanulate, (1.7)2–4.3 cm. long, irregularly 4–5 lobed with the lobes up to 1 cm. long, ribbed, glabrous to sparsely puberlous outside, sometimes with irregularly scattered small glands. Corolla large, 6–12 cm. long, widely cup-shaped, at first yellowish, later becoming reddish to purplish, streaked darker inside and outside, glabrous except sometimes at the point where the filaments become free; limb bilabiate, the superior lip bilobed, the lower one 3-lobed and recurved, lobes more or less rounded; corolla tube cylindrical at the base and suddenly widening and incurving upwards. Stamen-filament 3.5–6.5 cm. long, adnate up to 1–2.5 cm. from the base of the corolla tube; anthers 7–13 mm. long; staminode rather large. Disk c. 1 cm. in diam. 2–3 mm. high, fleshy, irregularly lobed, sometimes almost truncate. Ovary 8–15 mm. long, cylindrical; style 4–7(8) cm. long, filiform. Fruit sausage-shaped up to 1 m. long and 18 cm. in diam., pendulous from a long peduncle, greyish-brown, lenticellate in the youth, massive, wood-walled, indehiscent. Seeds 10 x 7 mm. numerous, wingless, embedded in a fibrous pulp; testa coriaceous; cotyledons folded. Kigelia africana subsp. moosa (Sprague) Bidgood & Verdc. Mannheimer, C.A. & Curtis, B.A. (eds.) (2009). 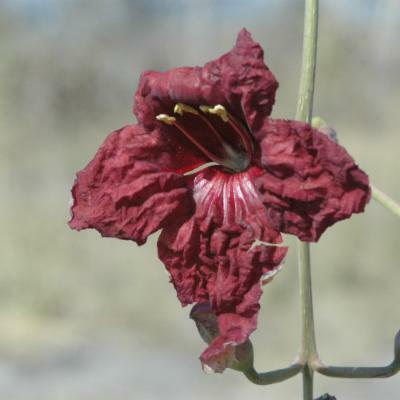 Le Roux and Müller's field guide to the trees and shrubs of Namibia, rev. ed. : 1-525. Macmillan Education Namibia, Windhoek. Setshogo, M.P. (2005). 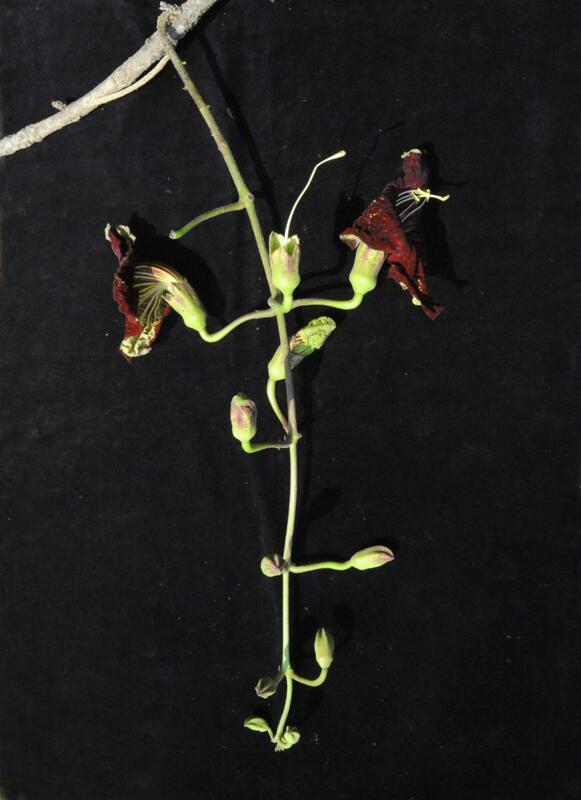 Bignoniaceae Southen Africa Botany Diversity Network Reports 37. Curtis, B. & Mannheimer, C. (2005). Tree Atlas of Namibia: 1-688. The National Botanical Research Institute, Windhoek. Diniz, M.A. (1988). 124. Bignoniaceae Flora Zambesiaca 8(3): 61-85. Royal Botanic Gardens, Kew. Gentry, A. H. (1985). Bignoniaceae Flore du Gabon 27: 19-56. Muséum National D'Histoire Naturelle, Paris. Liben, L. (1977). Bignoniaceae Flore d'Afrique Centrale (Zaïre - Rwanda - Burundi): 1-39. Jardin Botanique National de Belgique, Meise. Boulvert, Y. (1977). Catalogue de la Flore de Centrafrique 3: 1-89. ORSTOM, Bangui. Ramundo, D. (2009). Red List of South African Plants, Strelitzia 25. South African National Biodiversity Institute, Pretoria. Bidgood, S., Verdcourt, B. & Vollesen, K. (2006). 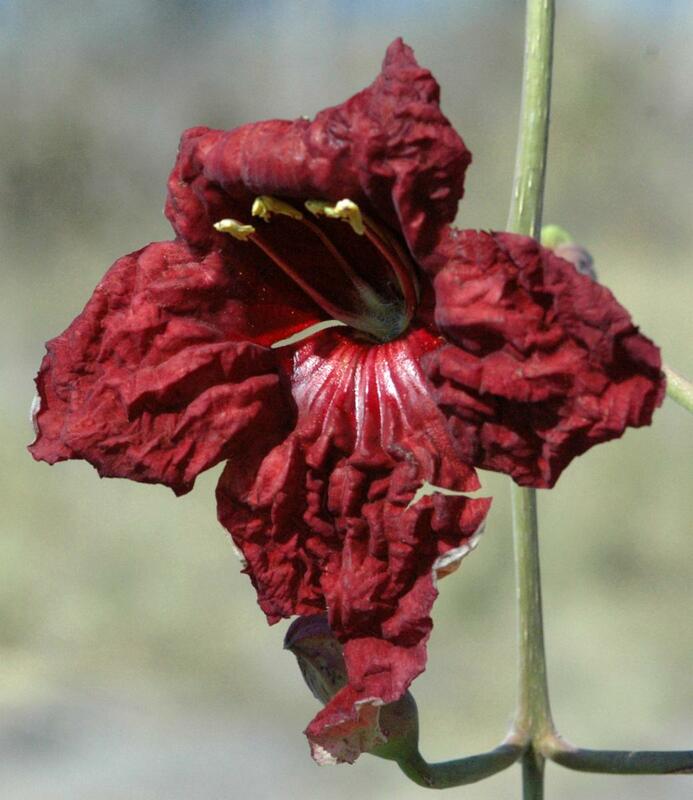 Flora of Tropical East Africa, Bignoniaceae. Royal Botanic Gardens, Kew, London. Maundu, P. & Tengas, B. (2005). Useful Trees and Shrubs for Kenya. World Agroforestry Centre. Grace, O. & Davis, S.D. (2002). Kigelia africana (Lam.) Benth. In Oyen, l.P.A. & Lemmens, R.H.M.J. (eds), Plant Resources of Tropical Africa. Precursor. PROTA Programme, Wageningen, the Netherlands. Pp. 98-102. Roodt, V. (1993). The Shell Guide to the Common Trees of the Okavango Delta and Moremi Game Reserve. Shell, Gabarone. Launert, G., Bell, E. & Goncalves, M. (eds) (1988). 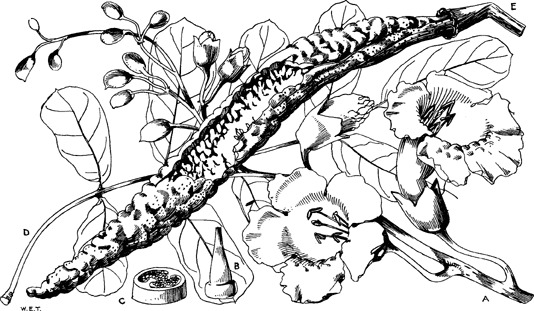 Flora Zambesiaca, Volume 8, Part 3. Royal Botanic Gardens, Kew, London. Burkill, H.M. (1985). The Useful Plants of West Tropical Africa, Volume 1. Royal Botanic Gardens, Kew, London. Harris, B. & Baker, H. (1958). 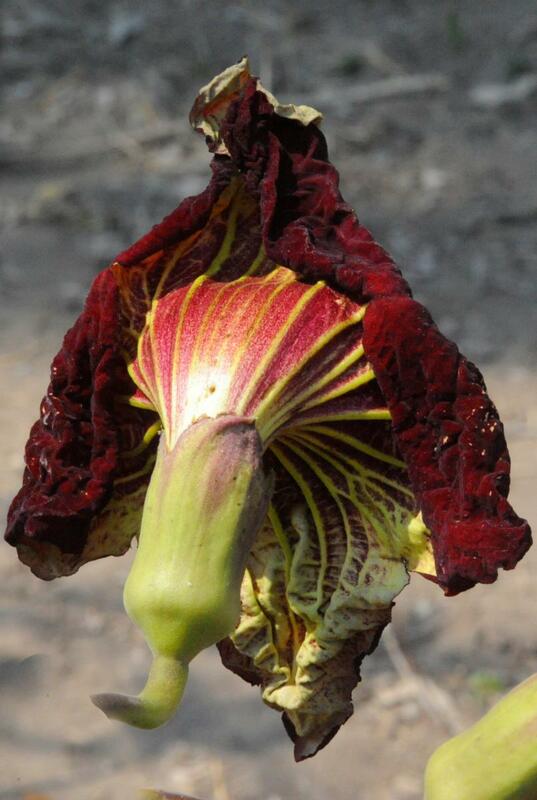 Pollination in Kigelia africana. J. W. Afr. Sci. Assn. Vol. 4: No. 1.
incl. var. aethiopica (Decne.) Aubrév. ex Sillans and var. elliptica (Sprague) R. Sillans in Not. Syst. 14: 324 (1853). Smithies, S.I. (2003). Bignoniceae, In: Plants of southern Africa: an annotated checklist Strelitzia 14: 312-313. National Botanical Institute, Pretoria. Diniz, M.A. (1990). Bignoniaceae Flora de Moçambique 120: 1-35. Instituto de Investigaçao Científuca Tropical. Gentry, A.H. (1984). Bignoniacées Flore du Cameroun 27: 26-61. Ministère de l'enseignement supérieur et de la recherche scientifique (Mesres), Yaoundé. Gentry, A.H. (1977). Bignoniaceae Flora of Ecuador 7: 1-172. Botanical Institute, University of Göteborg, Riksmuseum, Stockholm. Hutchinson, J. & Dalziel, J.M. (1931). Bignoniaceae Flora of West Tropical Africa 2(1): 237-242. Fl. Som. 3: 303, fig. 209 (2006).